You may remember reading about Team Shayna in the TJP in 2010 and 2012. It was founded in 2010 to participate in the Red Balloon Event in honor of 7-year-old, Shayna Strauss, the daughter of Dawn and Brad Strauss. Shayna was diagnosed with congenital heart defects when she was 15-months-old and underwent open heart surgery at Children’s Medical Center. 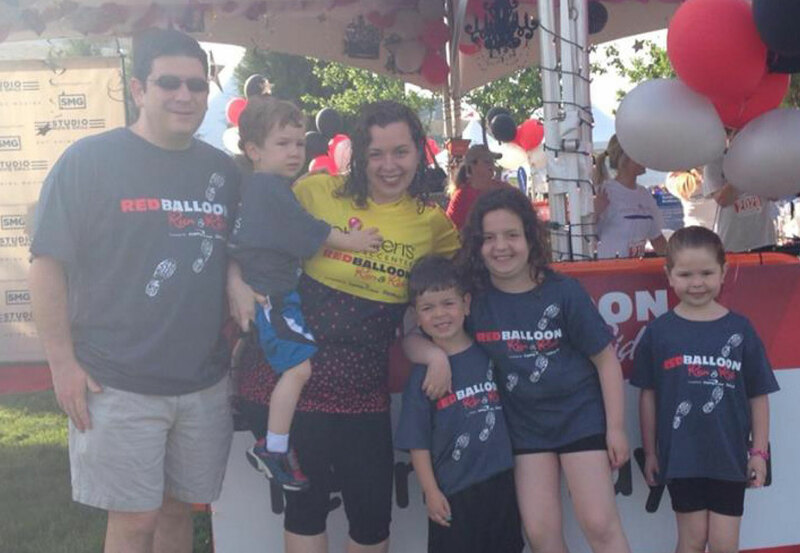 Team Shayna participates in the Red Balloon Event and fundraises for the Heart Center at Children’s in Shayna’s honor. This year, Team Shayna began its fundraising in January and raised more than $15,500 through a number of endeavors. There was a huge fundraiser in January at Fuddruckers, along with a raffle with some 250 people attending. Team Shayna’s Third Annual Pink Lemonade Stand at the Strauss home in March raised more than $1,000. Trailercakes donated 100 cupcakes to the stand and it was featured on the CBS evening news. An article was run about Team Shayna in the Huffington Post as well. Dawn wrote a piece for the Children’s Blog and Team Shayna made the cover of the Children’s donor magazine along with a two-page article about the group in April. These efforts culminated with the team running and walking in the Red Balloon Event April 26. Shayna was a featured patient meaning that signs with her pictures and story lined the race course. Congratulations to Team Shayna for an incredible five months. In the four years that Team Shayna has participated in the Red Balloon Event, it has raised more than $50,000 for the Heart Center. It is still possible to donate to The Children’s Red Balloon Run & Ride, a fundraising program produced by Passion for Children’s for the exclusive benefit of Children’s Medical Center. To visit the Team Shayna page visit, www.redballoonevent.org/goto/teamshayna2014. Mazel tov to Alexis Stern, director for the Richardson High School Law Magnet. Stern was one of 10 teachers selected as RISD’s STARS (Superior Teaching Achievement in RISD Schools) Teachers of the Year. Administered by the Excellence in Education Foundation and selected through a comprehensive process involving interviews and classroom visits, the 10 represent some of the finest educators in a district known for quality teachers. 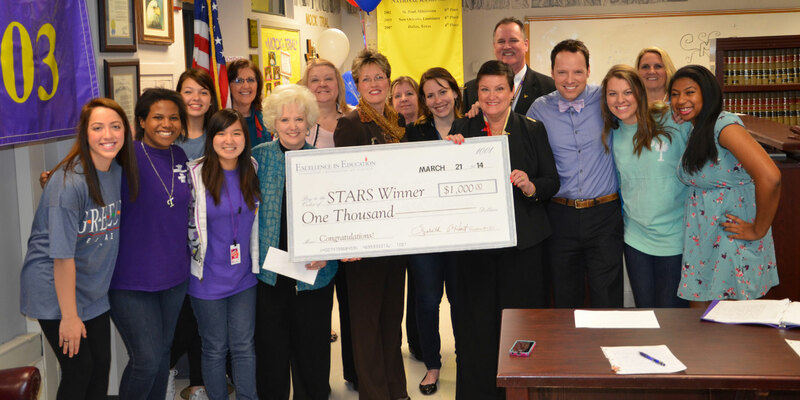 A “Prize Patrol” including RISD Superintendent Dr. Kay Waggoner and members of the Excellence in Education Foundation board and selection committee surprised teachers in their classrooms with flowers, balloons and a check for $1,000. Stern was selected in April to represent RISD as its secondary nominee for Region 10 Teacher of the Year, the winner of which advances to State. The Richardson Law Magnet’s loss will be Harvard’s gain. Stern will attend Harvard’s Graduate School of Education in the fall. “My plan is to train educators and later go into policy,” she wrote the TJP. As an innovative way to finance her education, Stern is crowd funding to pay for the $70 thousand tab. To donate, visit https://fundly.com/m2/career-high-school-teacher. A 2002 graduate of Richardson High School and a 2006 graduate of UT Austin, Stern is the daughter of Robert Stern and Melissa Fenton-Stern. Congratulations to Dr. Jonathan Nathan who has been awarded a Fellowship in Cosmetic Plastic Reconstructive Surgery at Chicago Loyola Hospital. Nathan attended SMU and Tulane University and completed his residency at Texas Tech. He is the son of Bassim and Karen Nathan and brother of Daniel and Todd. The Martin Hochster Jewish War Veterans Post 755 does yeoman’s work for our community. In observance of Memorial Day, the vets placed American flags on more than 100 Jewish graves throughout Tarrant County. When the JWV Post 755 convenes at 10 a.m., Sunday, June 1 at Beth-El Congregation, U.S. House Representative Kay Granger (R-TX) will be presented with The Morton Herman Service to Veterans Award. Rep. Granger has continuously strengthened our area’s contribution to America’s defense systems and supported efforts to provide for our servicemen and women not only on the battlefield, but when they return home as well. Among other things, within the past two years, she worked hard with others to prevent the Texas National Guard C-130 squadron from being transferred to Montana from Joint Naval Reserve Base, Fort Worth. In the past week, her legislation to give the Congressional Gold Medal to the Monuments Men just passed the House and Senate. She has been the recipient of The Air Force Foundation Award and the Marine Semper Fidelis Award. An installation of JWV officers for the coming year will follow. They are: Ron Sivernell, commander; Peter Levy, senior vice commander; Arnold Abrams, junior vice commander; Will Cutler, quartermaster; Rabbi Sidney Zimelman, chaplain; Nelda Sivernell, adjunct; Dr. Michael Bumagen, historian; Laurin Baum, ceremonies and flags; Marc Neerman, at large. Dr. Barry Schneider, commander of Texas, Arkansas, Louisiana, Oklahoma District Jewish War Veterans, will install officers. Assisting him will be George Sepp, past commander, TALO District. JWV 755 will also be giving special recognition to our surviving World War II veterans. I have been a Holly Berkowitz Clegg fan since her early days, when Trim and Terrific American Favorites was launched in 1996. Benjamin was in diapers, and those superfast, healthy recipes were exactly what I needed. With more than 100 types of arthritis and no known cure, physical therapy, medication and lifestyle changes, such as healthier eating and recipe preparation modification, are the best defenses to a condition that plagues many. There are studies that support a diet high in anti-oxidants and omega 3’s help to fight inflammation which helps pain associated with arthritis. Holly shared with the TJP that her father, Jerry Berkowitz, has had three hip replacements and suffers with arthritis and her mother, Ruth Berkowitz, fights osteoporosis, however, this pain can affect all ages. “From sitting at the computer to aging joints, I wrote this book to help people enjoy food while hopefully, eating to make a difference,” Holly said. With chapters that include “No Fuss Foods,” “Bone Building” and “Spice Up Your Life” and recipes that are diabetic-friendly and gluten-free, you will be amazed at these simple, healthy and delicious recipes with less than 10 ingredients that will help to fight arthritis. “Eating Well to Fight Arthritis” is available in your local bookstores, online and on Holly’s website, www.hollyclegg.com Sign up for Holly’s Monthly Menu Newsletter on her website. Holly was kind enough to share three of her recipes — Honey Mustard Salmon, Watermelon and Tomato Salad and Curry Chicken with our readers. You can find these on our website at tjpnews.com in the Around the Town section. She signed a menu consulting agreement with Our Lady of Lake Hospital in Baton Rouge (the largest hospital in Louisiana) to offer cafeteria “Holly Clegg” specials and eventually provide menu options for patient services. Holly’s book, “Eating Well Through Cancer,” is now available in Chinese and she is currently working on a Spanish edition. She is working with Albertsons, Inc. to provide recipes for their weekly newsletter. Holly has worked with Baylor Hospital in their cancer center and diabetes center giving cooking classes. Holly and her husband Mike bought a second home in Dallas to be close to their grandson, Clegg Goldberg and his new baby brother, Kase Ryan, born on May 12. Her daughter is Courtney Goldberg who is married to Chad Goldberg. After two intense days of religious ceremonies in Bethlehem and Jerusalem, meetings with Israeli and Palestinian officials, unscheduled photo opportunities and debilitating traffic arrangements, Israelis and interfaith relations experts are trying to attach the appropriate symbolism to Pope Francis’ visit to the region. Nearly every stop made by the pontiff was subjected to simultaneous scrutiny and praise. While long-term tensions between the Jewish people and the Catholic Church were made apparent by the trip, some experts are acknowledging a thaw in Israel-Vatican relations. “The Jewish people and the Catholic Church in recent years have found that their 30 years of dialogue have paid off and friendly relationships have resulted,” said Betty Ehrenberg — executive director of the North American branch of the World Jewish Congress and chairperson of the International Jewish Committee on Interreligious Consultations, an umbrella organization representing prominent Jewish organizations in discussions with leaders of other faiths. “We have to realize that we have problems in common, and we have to work together on these problems,” she said. Also important, in Ehrenberg’s estimation, is the message that the visit sends to Middle East Christians who find themselves under the constant threat of attack. But by visiting the Middle East, the pope “has shown that he is present and that he cares, and gives Christians here in the region strength,” Ehrenberg said. “Hopefully we can work together with the Catholic Church to help ensure religious freedoms for everyone around the world, and for protection,” she said. Pope Francis planted roots for improved interfaith relations even before being elected pontiff, said Giuseppe Platania, founder of Italy’s Israel Allies Caucus, an alliance that fosters cooperation and dialogue between the Italian Senate and the Israeli Knesset. Platania said Francis made a “significant” symbolic gesture during his first week as pope by making a phone call to the chief rabbi of the Jewish community in Rome. “When you become a leader of over a billion people, what you do carries tremendous weight,” he said. Appropriately, then, every stop by Pope Francis on his Israel trip — planned and unplanned — was scrutinized for its symbolism. The pope referred to Palestinian Authority-controlled territory as the “Palestinian State,” a move that contradicts the U.N. status of the Palestinian Authority as a “non-member observer state.” Francis also landed first in the Palestinian city of Bethlehem, a day before his official state welcome by Israel at Ben-Gurion International Airport. According to Platania, Francis was not the first pope to visit Palestinian-controlled territory before setting foot in fully sovereign Jewish territory, and the order of the pope’s itinerary may have had more to do with religion than politics. The New Testament identifies Bethlehem as the birthplace of Jesus. “Maybe there is a stronger Christian connection to start [the trip] by going to Bethlehem than by going to the Kotel,” Platania said. Ehrenberg said there is nothing new about the Vatican’s policy toward Palestinian statehood. 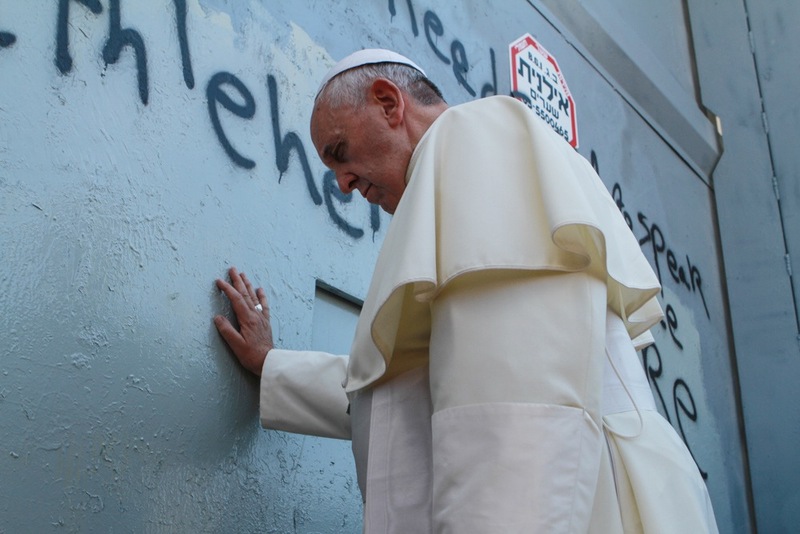 The pope then surprised many by making an unscheduled prayer stop at concrete sections of a wall separating Bethlehem from Jerusalem, erected in 2002 to prevent terror infiltrations into Jewish population centers. He prayed in front of graffiti that read “Free Palestine” and (in broken English) “Bethlehem look like Warsaw Ghetto,” leading to widely distributed photos. Even “the best of our friends, eventually even with the best intentions, may want to use that friendliness, the diplomatic efforts, smiles, and phone calls to rabbis to help promote their own agendas,” Platania explained. A longer-term issue between Israel and the Vatican relates to valuable Jewish artifacts dating back to the period of the First Temple in Jerusalem and believed to be held in Vatican archives that have been off-limits to Jewish leaders. Yet the Israeli government appears patient on the artifacts issue, and is hopeful that there is much to be gained by improving relations with the Vatican. Peres and Palestinian Authority President Mahmoud Abbas, meanwhile, accepted an invitation from the pope to pray for peace at the Vatican. That gathering is scheduled for June 6. Passover’s recent seders once again reminded us, as they do every year, that we — today, and into the future — were together with our long-ago ancestors when they took that seminal Jewish journey out of Egypt. And now Shavuot is on the horizon, telling us to remember that all Jews — yesterday, today, tomorrow — stood together at Sinai to receive our Torah. Shavuot also makes sure we recognize those among us who have come to Judaism through choice rather than by birth, for it honors Ruth, our early and most famous convert, whose line later extended to King David. Yitzhak Jordan (“Y-Love”) is a black hip-hop musician who creates Talmudic rhymes. Growing up in Baltimore, he started “thinking Jewish,” he said, and by age 14 was going to shul and teaching himself prayer book Hebrew. Formal conversion was in Brooklyn when he was 22; he later attended an Israeli yeshiva for converts, where his black fellow students included several Ethiopians and the Crown Prince of Swaziland! Karen Nielson-Anson of Salt Lake City calls herself a “Mo-Jew” — a former Mormon. Never happy in her birth religion, she played “Fiddler on the Roof’s” Fruma Sarah onstage three times, which “probably lit the fire,” she said. Later she met and married a Jewish man who went with her to every conversion class because he hadn’t studied Judaism at all after his bar mitzvah. Her mother was glad that she was finally going to be religious! Hank Eng, an engineer, grew up in New York, the son of immigrant Chinese parents. He was working in Shanghai when he began to date an American Jewish woman who was also there on business. At his first seder, “I began to understand how a religion could be passed down ‘unchanged’ from the time of Abraham to Moses to today,” he said. After marriage, the Engs adopted a Chinese baby; Hank agreed to raise their daughter as Jewish, and completed his conversion in time for her bat mitzvah. Chris Van Allsburg, born to “casual Protestants,” grew up with no religion. He admits he didn’t convert because he was seeking a spiritual path, but because he fell in love with a Jewish girl whose father said it would break his heart if his daughter married someone who wasn’t Jewish. “The conversion process gave me insight into Judaism,” he said. “I realized the power not simply of faith, but of a culture that binds families.” Multitalented Chris has long written and illustrated children’s books, but his main work today is designing and sculpting mezuzahs. Tinamarie Bernard maintains she converted “because Judaism just fit.” Married to the son of a Holocaust survivor, she is the great-granddaughter of a high-ranking Nazi officer! “My husband and I now have a young daughter,” she said. “So imagine this: In two generations, two families inextricably linked by horror are now linked by marriage, love and a baby. It feels like coming full circle, like finding the home I never knew I left.” The Bernards now live in Israel. I grew up with little knowledge of the holiday of Shavuot, and my children are learning songs for it in religious school. Could you please fill me in about its significance? This coming Tuesday night, June 3, Jews around the world will observe the holiday of Shavuos, the 3326th anniversary of our receiving the Torah at Mount Sinai. This is the day that the Jews received the Ten Commandments from God, and accepted upon themselves the entirety of the Torah, including its study and the observance of the 613 mitzvos. Many in Dallas and throughout the world observe an “all-nighter” study session, spent engrossed in intensive Torah study until the morning. There are many messages included in Shavuos and we shall offer one perspective here. The Torah describes the Jews’ arrival at Sinai, “and the nation encamped across from the mountain.” This encampment is expressed in the singular, (vayichan), not in the plural tense (ve’yachanu) which seems to be the incorrect tense in Hebrew for a group of people. Why would the Torah use this phrase? The commentaries explain the Torah is hinting that this was the one unique instance in Jewish history that the entire nation was together with no disputes, “like one person with one heart.” All other encampments were with argument and disunity. Why was this encampment so different? The Torah is the great unifier of our people. Every Jewish soul is connected to a letter, line or crown of a letter of the Torah. Only a Torah, which is complete with no letters missing, is kosher. Only a totally united Jewish people is complete, connecting the “lines, letters and crowns” of their souls into one Torah scroll which is the Jewish nation. If even one Jew would have disagreed to receive the Torah it could not have been given, as the great “Torah scroll in the heavens” would have not been complete. We suffer, unfortunately, from many divisions in our people. The best way Jews can repair their divisions and reunite is to study Torah together. We are reminded of the profound words that Senator Joe Lieberman uttered over a decade ago at the DATA Speaker’s Series, “although perhaps we can’t necessarily all pray together, why can’t we at least all study together”?! Shavuos is a time to join a study session, class or program and be immersed in Torah study with fellow Jews. It’s also the perfect time to increase our Torah study and Jewish literacy throughout the year, much as the Jews accepted upon themselves the yoke of Torah for all time more than 3000 years ago. The more we join together studying and celebrating Torah, the more we will ensure a vibrant Jewish community and Jewish continuity for eternity. Anyone interested in joining a study session near you for Shavuos or throughout the year please feel free to contact me at yfried@sbcglobal.net or at DATA, 214-987-3282 and ask for any rabbi. Wishing all the readers a meaningful and joyous Shavuos with peace in Israel and throughout the world. It’s summertime and that means more time outside. Everyone should experience nature — it a Jewish thing. So get involved — here is a little learning, a little thinking and then a lot of doing! An important Jewish value for taking care of the world is: Bal Taschit, Do not destroy! Shabbat teaches us the relationship between nature and mankind. We were given six days to manage the earth but on Shabbat, we must neither to create nor destroy. On Shabbat, we can just enjoy the beauty of the universe. Jewish agricultural laws also give us the “sabbatical year” to give the earth a rest. Care is to be taken that bits of broken glass should not be scattered on public land where they may cause injury. Pious people often buried their broken glassware in their own fields. A Tannery must not be set up in such a way that the prevailing winds can send the unpleasant odor to the town. Whoever breaks vessels, tears clothes, demolishes a building, stops up a fountain, or wastes food, in a destructive way, transgresses the law of bal tashchit. Recycling is a beginning to help the world. How can we improve our recycling? Can you go through your toys and clothes and give any away? What other ways can you can give to others? Set up a recycling area in your home or neighborhood: plastic bottles, soda cans, paper? Decide and do. Take a Jewish nature hike — look with eyes that see God’s creation. Enjoy beauty — say a blessing. RIGHT: Buddy Cohen during military service in WWII. | Photos: Courtesy of Forté Group, Inc.
For Buddy Cohen, 102-year-old Army veteran and member of The Legacy Willow Bend senior living community, Memorial Day brings very personal memories to mind. Cohen had many eye-opening encounters while serving in the military during WWII. He recalls experiencing strong feelings of camaraderie, patriotism, fear and loss. This Memorial Day, he stresses the importance of pausing to pay tribute to those who made the ultimate sacrifice. Plaque of the award Cohen earned from service in WWII. Cohen was part of the 339th Infantry Regiment of the 5th Army’s 85th Division, which freed more than 100 prisoners — men and women throughout Europe who had “defied Hitler” in some way. Among them were the Austrian chancellor Kurt von Shuschnigg, Prime Minister Leon Blum of France, Berlin’s Pastor Niemoller and Hjalmar Schacht who had directed Germany’s Reichsbank. These renowned individuals, as well as others from 22 different nations, were to be executed, but the 5th Army saved them in time. Cohen considers the opportunity to meet those important people, as well as meet the wife of one of the men who attempted to assassinate Hitler, some of the most meaningful experiences he had during his service. However, the moment that stood out perhaps the most in his mind occurred on his voyage home. “I remember spending a lot of time in northern Italy helping soldiers. In fact, I was helping a group that supposedly was headed to Japan from there when we got word that the bomb had been dropped and the war was over,” said Cohen. Cohen was sent to Switzerland for R&R after that and finally boarded a ship with six or seven other officers from various units going back home to the States. It was such a surreal feeling to him that it took a while to fully comprehend. Cohen was awarded the Bronze Star for “Meritorious Achievement in Ground Operations Against the Enemy as part of the 339th Infantry Regiment” and recognizes that while he was able to make it home after years of hazardous duty overseas, many were not. Memorial Day is about paying tribute to those individuals and all members of the military who lost their lives while serving the country. Submitted by Amy Jones on behalf of the Legacy Willow Bend. I always enjoy your weekly column. However, there was something in the latest column that I struggled with, and so I wanted to get your thoughts. It concerns the statement that the fetus is part of the pregnant woman’s body and as such, capital punishment would not be delayed for a pregnant woman purely for the reason of her pregnancy. But if a fetus is purely to be considered part of a woman’s body, then does that not suggest that elective abortion on demand should be permissible? My understanding is that elective abortion is not permitted under Orthodox Judaism. I am having trouble reconciling the opposition to elective abortion on one hand with the idea that the fetus is part of the mother on the other hand. Perhaps the answer lies in the idea that our bodies belong to Hashem and that we should not undergo any medical procedure unless it is necessary. For example, I understand that liposuction or a “nose job” are not kosher because those procedures entail non-essential incisions in the body that Hashem gave us. So perhaps elective abortion should be impermissible because it is a non-essential medical procedure. Permit a silly example — a woman’s foot is part of her body and so it would be halachically impermissible for her to electively decide to amputate a healthy foot. So, this could explain the halachic ban on elective abortion without changing the assumption that the fetus is purely part of her body. But is this all the protection that halacha provides to a fetus? It seems like a fetus — with a beating heart — is different in kind than an earlobe or pinky toe. What is the right way to think about this? Excellent question — I have struggled with it myself for quite some time. You are correct, the fetus is not afforded protection simply because it is no more than a “foot” of the mother. If that would be the case, any time the baby’s birth would cause mental stress on the mother we would allow an abortion, similar to the liposuction or “nose job” that you mention which is allowed when a person has mental stress over their looks, (subject to the approval of a rabbi that their situation constitutes ample stress for that allowance). We know this not to be the case with abortion. In fact, most halachic authorities consider an abortion performed without halachic permission to be an act of murder. Obviously, the amputation of a leg is not an act of murder. This ruling indicates that the fetus is considered its own life. If so, your question resurfaces; why would we not be required to hook up a brain-dead pregnant mother to a ventilator in order to rescue her fetus? The answer is somewhat nuanced and even complicated. Although the fetus is considered to have a life of its own, it is not considered to be “fully alive.” This means that its status is that of a “partial life” and not that of a fully living human being. For example, to kill a fetus is, as we mentioned, considered to be an act of murder. The one who carries it out, however, would not be subject to the death penalty like one who murders another person. It is considered, in the words of the authorities, murder in the “court of Heaven” although a court of law could not try and punish him for murder. Halacha considers the fetus to be “fully” alive when either the head or the majority of his body presents itself outside the mother. For that reason, if the mother’s life is threatened by the fetus, her full life supersedes the partial life of the fetus; until the head or majority of the body is present. At that point they are considered on equal footing. The mitzvah of doing everything possible to save another Jew, even to the point of another suffering pain, applies only once that Jew is fully alive. This does not, however, apply to one not yet born; we need not or should not force the mother through undue protracted suffering by prolonging her death to attempt to save the erstwhile partial life of her fetus. Our annual day for remembering the Holocaust has come and gone, as has the one for honoring the State of Israel. But 24 hours per year for each is hardly enough. And so it should be with those other important days: We honor Yom HaShoah and Yom HaAtzmaut when they occur, but they must be with us, in our consciousness, throughout the entire year. How can we forget what we recently learned: that college students working in the archives of Amsterdam have found letters of complaint from Holocaust survivors: 217 of them had been dunned for back taxes on properties that the Nazis took from them before deportation, taxes that had come due while they were bound for extermination! How dare we forget the Shoah when it keeps rearing its ugly head? A leader of today’s Dutch Jewish community says that many Nazi collaborators had taken over those homes, then left them — and their unpaid bills — when they ran away after the war. The city’s ruling, dating back to 1947, made the original, legal owners responsible, even in this ironically cruel circumstance: They owed money for gas used to heat their former homes while the Nazis were gassing them! Survivors whose houses and money had been confiscated came back to find they no longer owned either their homes or the funds to pay back taxes on them! How dare we downplay the importance of the State of Israel as a sanctuary for all Jews in the face of the anti-Semitism we ourselves still face today in our oh-so-enlightened United States? Have you heard about Daniel Clevenger, up until recently the mayor of Marionville, Mo., a town with a population of just more than 2,000? Because of some young people’s efforts, Amsterdam is finally considering compensation for its Jews. Because Clevenger faced impeachment after a vote by Marionville’s aldermen, he resigned his position. But we must remember that it has taken the Dutch city more than 65 years to face that cruelty of its past, and that the vote to oust Clevenger in today’s Middle America was not even unanimous. We Jews today, here and everywhere, are held hostage by a collective past that keeps intruding on our collective present. For example: should we believe Palestinian President Mahmoud Abbas’ recent pronouncement that the Holocaust was “the most heinous crime to have occurred against humanity in the modern era” in light of his history as a denier? Not many years ago, he was disputing the number of Jewish Shoah victims, and accusing Zionists of collaborating with the Nazis to funnel more Jews to Palestine so that it could eventually become a Jewish state. If my Boubby the Philosopher were reading today’s newspapers, she would shake her head sadly at the account of NBA bigwig Donald Sterling and proclaim, in truth, that he is a Jew who is no good for the Jews. Especially when we must fight the current stupidity of one of our own, how dare we downplay the importance of the Holocaust and of the State of Israel for all of us? We are reaching the end of the school year and that means graduations for many. Graduation is an ending, and also a beginning. As Jews, we celebrate endings, beginnings and all the many in-between times with blessings (and, of course, food). Each Shabbat the tradition is to bless our children with the hopes we have for them. It is important to take the time to reflect on our hopes and dreams for our children as well as to give them direction. This “blessing” below is one that I got from somewhere a long time ago. We read it to our sons when they became bar mitzvah. As our children graduate from the many milestones in their lives, this is a good wish for them (at any age). Feel free to make it your own and add your special messages to your graduate! Build us a son whose wishes will not take the place of deeds. A son who will know Thee — and that to know himself is the foundation stone of knowledge. Lead him, we pray, not in the path of ease and comfort, but under the stress and spur of difficulties and challenges. Here let him learn to stand up in the storm; here let him learn a passion for those who fail. Build us a son whose heart will be clear, whose goal will be high. A son who will master himself before he seeks to master other men. One who will reach into the future, yet never forget the past. And after all these things are his, add, we pray, enough of a sense of humor so that he may always be serious, yet never take himself too seriously. Give him humility so that he may always remember the simplicity of true greatness, the open mind of true wisdom and the neatness of true strength.